This program extends possibilities of well-known Spectrogram with some new useful features. It enables to define the scrolling area to any size, it can save screen shots in defined time periods (useful overnight), it enables to browse the saved pictures easily. All the settings can be saved to named profiles. EasyGram.zip (300 KB) containing latest version of EasyGram.exe, the main executable. EasyGramINI.zip (618 Bytes) containing the configuration file example. Spectrum.zip (38 KB) containing DLL with FFT functionality. This DLL is necessary to run EasyGram. Author of this DLL is R.S.Horne. Note: No installation is necessary. Copy all the files to one directory and run EasyGram.exe. o- Add, edit and delete QSO, all in user-friendly way. o- Import QSOs from some other formats (e.g. QSOs were originally entered to some other program (contesting)). o- Locate the other station - small window shows you a compass poiting to which direction you should rotate your antenna giving also azimuth (in degrees) and distance (in kilometers). o- Inspect the other station. This means that all the texts you ever received from the station are displayed at once in one window. This is useful when you need to know the name of the operator, for example. o- Browse QSOs. By entering a part of a callsign you can filter a database. This can be used also for fast finding of a callsign. o- Filter QSOs on the date and time basis. This way you can get list of QSOs from a certain time period only (e.g. contest). o- Filter QSOs on the conditions basis. This way you can filter your QSOs to nearly whatever condition. For example, QSOs from only one band and QSOs that were not QSLed at the same time. o- Count QSOs, countries and callsigns. Counting can be applied to already filtered database. o- Histogram to find out in which time of day you did most QSOs. 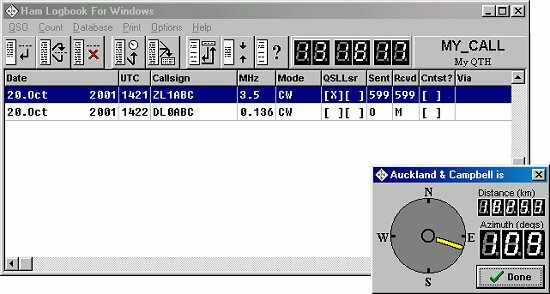 o- Print your QSOs, either to a desktop printer, or to a file. o- Back-up QSOs to prevent loss of your data. The back-up file can be created either on a HD or to one or more diskettes. o- Customize the application. You can define more your callsigns and QTHs, you can define names of months in your native language, you can use time correction (to get UTC yet not to have to change your system clock), etc. First install Borland Database Engine (redistributable files), then put both Setup.exe and Setup.w02 in the same folder and run Setup.exe to install HLFW..